Held on certain Saturdays, weather permitting, throughout the year. 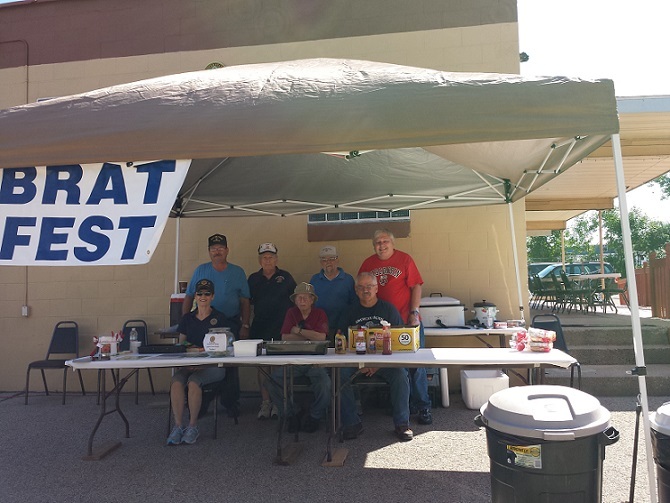 Our brat fest/ garage sale / book sale is scheduled for Saturday, June 16, 2018, 10:00 am - 6:00 pm at Post 501, 105 Dempsey Road, Madison, WI 53714. Note that we will also be having a garage sale this day. Post Cdr. will be at the Post 501 on dates and times TBD to accept your donations. According to the Post Cdr., please do not bring TV's, electrical appliances, or junk. Only quality new/used items will be accepted. Please contact the Post Cdr. if you have questions at 608-244-7716..
We offer Johnsonville brats $4 (full meal for $5), a full hamburger $4 (full meal $5), hot dogs $2 (full meal $3), with or without buns, condiments, soda or water, and a wide selection of chips. Plenty of room for parking your car/bike so drive, bike, or walk -- better yet - run for a reasonable priced lunch of Wisconsin brats and hot dogs. Next Brat Fest scheduled for July 7th at Metro Market.